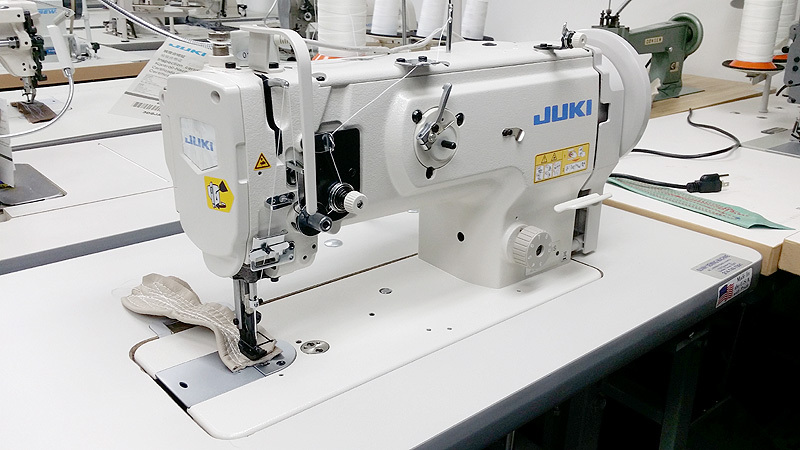 New JUKI Single Needle Walking Foot Sewing Machine with Side Load Bobbin, Complete and Fully Assembled. Made in Japan. The JUKI DNU-1541S is the ideal machine for sewing light to medium-heavy leather, canvas, vinyl and thick synthetic materials. Great machine for upholstering automotive, marine and aviation seats, furniture upholstery, leather bags, belts, wallets and other similar articles. This JUKI machine is one of the very few (if not the only) still made in JAPAN. Undisputed quality of materials and workmanship make this machine one of the most loved in the high end upholstery industry. With its larger needlebar stroke, higher presser foot lift, and newly adopted double-tension mechanism, the machine offers excellent sewing capabilities and responsiveness. The machine's rectangular feeding motion promises the consistent feeding of materials of all thickness without stitch gathering. MOTOR & VOLTAGE: This machine is equipped with a SERVO motor operating on standard 110 Volts power.